This new tool aims to provide students and researchers with an opportunity to create and manipulate sounds. For students, concepts in acoustics and music cognition can be difficult to learn as these ideas are difficult to visualize. 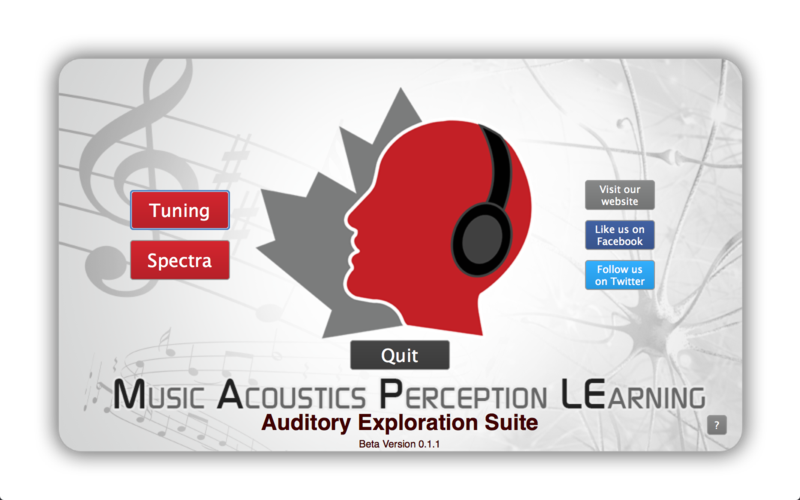 This tool provides real-time sound synthesis and manipulation that allows students to better understand these concepts. This can be demonstrated during class, or provided to students to use on their own personal devices. For researchers, further development of the tool will allow users to generate auditory stimuli for experiments. This will allow stimuli to be created rigorously, with specified frequency and envelopes. The tool currently has two components: Tuning and Spectra. Details on both components are explained below. The window contains many interactive buttons, menus, number boxes, and sliders. Number boxes and sliders update simultaneously, allowing the user to enter a precise numerical value or continuously slide across a range of values. This program focuses on manipulating the frequency of a single harmonic (i.e. “Harmonic (mistuned)”) to demonstrate the overtone popout effect. 1. Description: Provides instructions on how to use the software tool. 2. Harmonics: Dropdown menu to select the number of harmonics to be played (up to 16). The button turns the sound on/off. 3. Master volume and frequency controls: Controls the intensity of all sound output from the program, and the fundamental frequency of all harmonics (100Hz-1000Hz). 4. Harmonics (tuned) intensity: Controls intensity of all played harmonics except the “mistuned” harmonic. 5. Home button: Returns the user to the home screen. 6. Harmonic (mistuned) selector: Dropdown menu to select the one harmonic to manipulate in terms of frequency and intensity (can be selected from none up to the 16th harmonic). 7. Harmonic (mistuned) deviation: Controls the frequency deviation of the harmonic, from -1 (less one octave) to 1 (up one octave). The red button resets value to 0 (no deviation). 8. Harmonic (mistuned) intensity: Controls the intensity of this mistuned harmonic. 9. 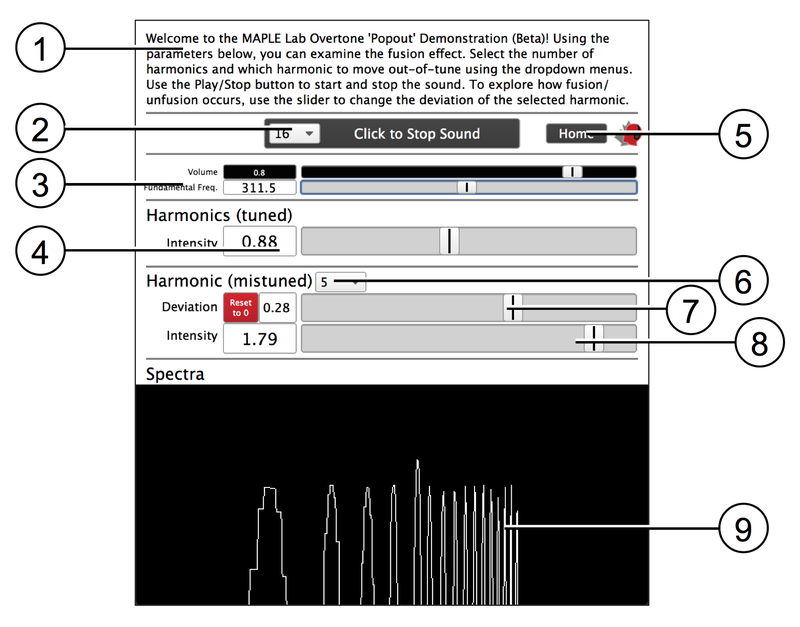 Spectra: Displays real-time spectra of the sounds produced by the program. Similar structure to the program component Tuning. This program focuses on comparing the static Power Spectra and time-varying Dynamic Spectra to real instrument recordings. An interactive “Harmonics” control panel allows for the creation of unique sounds, or manipulation of any Power Spectra sound. 2. Play/Mute button: Turns sound output from the “Harmonics” control panel on/off. 3. Frequency: Controls the fundamental frequency (100Hz-1000Hz). 4. Volume: Controls the sound intensity of all harmonics. 5. Harmonic intensities: Controls the intensities of individual harmonics. 6. Power Spectra: Preset values for the “Harmonics” control panel that mimic the spectra of instrument recordings. The buttons set the values in the “Harmonics” controls panel and plays the sound. 7. Dynamic Spectra: Synthesized audio that mimic how real instrument sound harmonics vary in intensity over time. The buttons play the synthesized sounds. 8. Audio Recordings: Recordings of real instruments, from which the Power Spectra and Dynamic Spectra data was generated. The buttons play the recorded audio. 9. Home button: Returns user to the splashscreen. 10. Oscilloscope: Top button opens an oscilloscope. Bottom button sets the view to fit sounds of approximately 440Hz into the oscilloscope with minimal drift. 11. 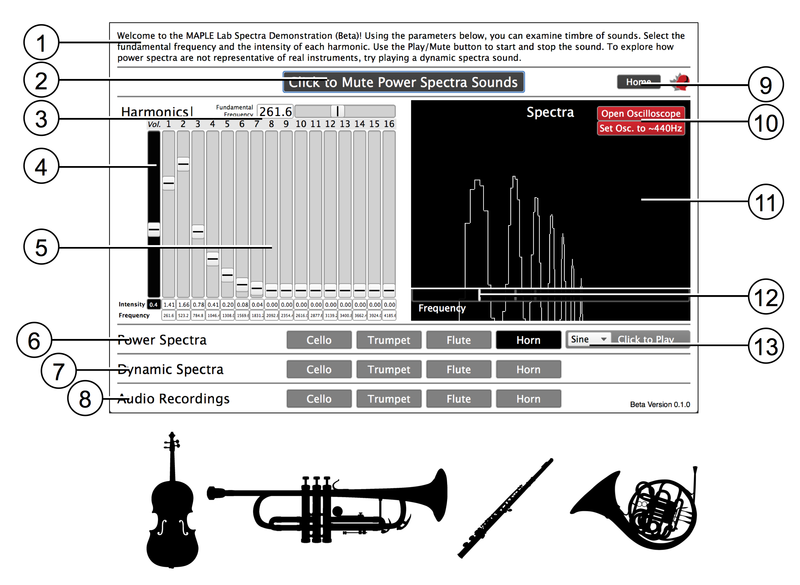 Spectra: Displays real-time spectra of the sounds produced by the program. 12. Harmonic indicators: Lines indicate positions of the 1st, 2nd, and 3rd harmonics. 13. Standard tones: Dropdown menu of sine, sawtooth, and square waves. The button sets preset values in the “Harmonics” control panel and plays the sound. 1. 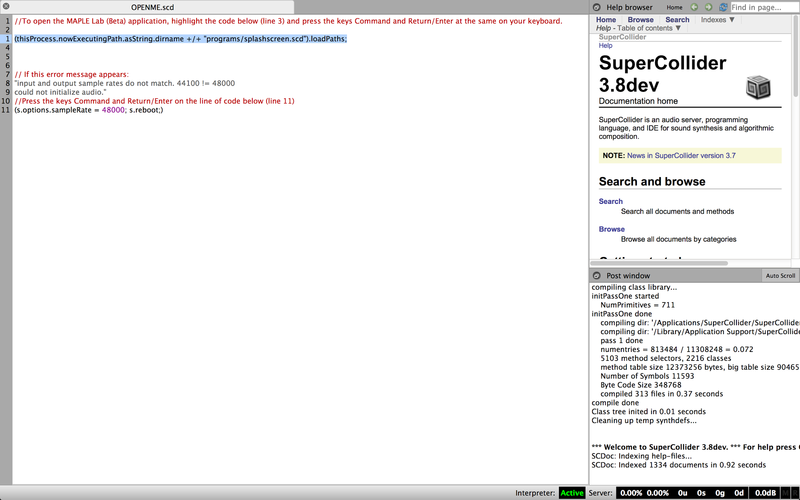 Download the latest version of the SuperCollider software (Mac, Windows, Linux). 2. Open and install the SuperCollider software on your computer. 3. Download the latest version of the MAESTRO (Beta). 4. Unpack the “MAESTRO-0-1-3-beta.zip” file. 5. Open the file “OPENME.scd” (which should open automatically in the SuperCollider software). 6. Follow the instructions within this file to launch MAESTRO. 7. Once the program is launched, select either Tuning or Spectra by clicking the buttons. Website links are also provided.